IT WOULD BE difficult to imagine a Twilight Zone without the genius of Rod Serling. And it's likely Rod would have had far less impact on the television industry without the help and support of Carol Kramer Serling, his wife. Their marriage provided Rod with sufficient motivation to persevere in spite of "forty rejection slips in a row," (as he once described it), leave the security of Cincinnati, and head for New York City just in time to assume a pioneering role in the developing TV medium. Television was lucky to have Serling. Long before the creation of The Twilight Zone, he had participated in the early shaping of TV drama, writing for such landmark programs as the Hallmark Hall of Fame, Studio One, Kraft Television Theater, and Playhouse 90. Rod was one of a handful of gifted young writers to whom the industry turned for direction during its "Golden Age." By 1959, the year The Twilight Zone had its debut, Serling had received three TV Emmys and a Peabody Award - the first ever awarded to a writer. The rapid transition from struggling playwright to successful producer put pressures on Serling and his family. "He was basically a writer," Carol recalls, "and a writer is a very solitary person who does his best work off by himself. In fact, he was nervous at first about appearing as an on-camera narrator for his own show. But I think he got comfortable with it after a while. He did have a very gregarious side, too." "He was nervous about appearing as an on-camera narrator for his own show." The Serlings were determined to maintain a normal, healthy home life for themselves and their two daughters, Jody and Ann. All during Serling's most productive years, they kept a second home on Cayuga Lake near Ithaca, far away from the pressure-cooker atmosphere of New York and Hollywood. Each year from the mid-50's onward, the family would shuttle back and forth between coasts, with Rod's heaviest work performed during the mild Southern California winter months, and the summer months reserved for relaxation and recreation in the wooded quiet of upstate New York. 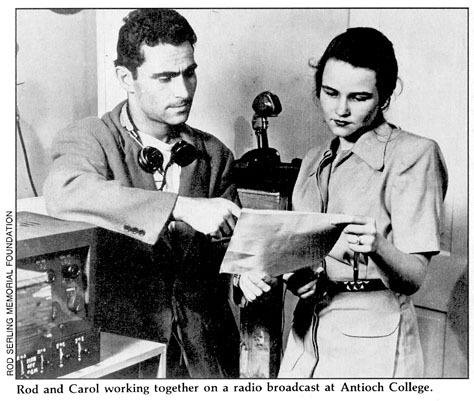 Since Serling's death in 1975, during open-heart surgery at the age of 50, Carol has helped maintain public access to his work and ideas. Her own creative contributions are evident in Stephen Spielberg's Twilight Zone - The Movie, a recent Broadway production of Requiem for a Heavyweight, a documentary on Serling in the works and in this magazine, among other activities. Carol graciously consented to this interview, in which she offers us some personal perspectives on her life with a remarkable man. Rosenbaum: Where did you and Rod first meet? Serling: At Antioch College, in Yellow Springs, Ohio. He was one of that large group of returning veterans right after the second World War. It was the fall of '46. I was a freshman. I was seventeen and Rod was twenty-one. We were married two years later, at the end of our second year. Rosenbaum: I know at one point you were living in a house trailer. When was that? Serling: That was right after the war. We lived in surplus trailers brought up from someplace in Texas, I think. There was no running water; there was kerosene heat and cooking. We had a communal place where everybody washed. The college put the trailers up - there must have been 20 or 25 of them. But nobody felt sorry for themselves, we were lucky to get them. Rosenbaum: Was Rod set on a writing career at that point? Serling: Not exactly. He didn't really know where he was going at first. He'd been accepted at Antioch while he was in high school, but the war intervened. He enlisted without graduating - and ended up in the paratroopers, which is another story. When he came back after the war, he took a college work-study job at a rehabilitation hospital near Chicago, because he had been wounded. Rosenbaum: Was it something serious? Serling: It was with him all his life. He was wounded in the wrist and the knee, but the knee was the serious one. He went through school with additional compensation because of disability. He could have had disability all his life, because the knee was always going out on him. He'd be going down the stairs and all of a sudden it would "snap". I'd hear a bong-bong-bong and I'd think, "Oh, God, he's falled down the stairs again." But he lived with it. Actually, his major that first year was Physical Education. After that, he began to get involved in theater, and later, broadcasting. Rosenbaum: What happened after graduation? Serling: We were graduated in 1950. Rod's first job out of college was at a radio station in Cincinnati. He had worked all over the country in radio during his Antioch college work periods. I think they were generally offering $45 or $50 a week. And WLW offered him the princely sum of $75 a week about two days before graduation. At WLW Rod was asked to write Geritol ads. [Laughs] With a southern accent and all, making up the testimonials. But he just up and quit one day, during the winter of 1952, about six months before our first daughter Jody was born - though he was also doing some free-lancing and working on a weekly dramatic show for another Cincinnati station. Rosenbaum: Did you help to support the family at that time? Serling: Yes, I was working up until Jody was born, and then there was a lot of pressure on Rod to make up the difference. And after a couple of years it just became impossible. Rod's agent said, "You've got to move to New York where the action is." Rosenbaum: So you left Cincinnati and moved to Connecticut. Serling: Right, in 1954. Our second daughter Nan was born in 1955 in Greenwich. And right about then Rod's career began to take off. Rosenbaum: What was that period like for you? Serling: It was very exciting. It was really an overnight recognition for him. It started with Patterns in 1955. Jack Gould in the New York Times gave the program a rave review. We had just moved to the east coast. We went out the night the show aired, and we'd told the babysitter that no one would call because we had just moved to town. And the phone just started ringing and didn't stop for years! Rosenbaum: How did you handle that? Serling: Listen, at least they learned to spell his name! They used to call him "Sterling" or "Sperling"! Rosenbaum: How did Rod deal with it all? Serling: Well, in the beginning it happened so quickly that you just didn't stop to think, "What's going on?" After a little while, you know that you hit a high or had a success. Then you start to say "Can I do it again? Maybe I can't reach that pinnacle again." And then you start to doubt yourself. It's cyclical. I think all writers and most people in the arts go through that. There is a high point, and it's damn hard to get there again; and then you begin to question your own ability. I know that Rod went through that for a couple of years, because the problem after the first success was that he would resubmit work that had been turned down and rejected in the past, and all of a sudden it would be bought. He would have been the first to say, "You know, there are some real dogs here." Not everything that he wrote was that good. So even though there was a lot of his work on TV, he began to wonder if it was real, if he could ever achieve that level of success again. Fortunately a couple of years later came Requiem for a Heavyweight, which received the same kind of public acclaim that Patterns had. That was proof that his first success really wasn't just a flash in the pan. Rosenbaum: What prompted you to move from Connecticut to California? Serling: Again, the business moved. When we first arrived in New York, television was mostly live drama. Starting around 1957 it became more of a film medium, and moved west. Actually, Rod went to Los Angeles earlier on a series of assignments for MGM. In 1955 we went out for three months while he worked on a screenplay - a terrible little dog called Saddle the Wind. And the following year he did the same for a three month period. That was sort of a testing ground for us, to see if we wanted to make the final commitment to move west. At that time - when we finally did move - our oldest daughter was ready for school, and we decided we couldn't continue the peripatetic life. We had to make a decision. We finally made the move in the fall of 1957. Rosenbaum: How did you manage to return each year to Cayuga Lake in Upstate New York? the sharp lines of demarcation: 'This is women's work and this is men's work." Serling: Well the summer place has been in my family forever. I've been spending summers up there forever. Rod and I spent our honeymoon there, and hardly ever missed a summer. We missed two summers - the summers the girls were born. But otherwise we always went up for July and August, from Ohio originally, then from Connecticut, then later from California. That was always a very important part of our lives - to spend as much time as possible up there. Rosenbaum: That was more or less your recreational time? Serling: Well, Rod never stopped writing, no matter where. The only place I can recall that he didn't have a typewriter or a dictaphone was when he was on the boat. And then he was thoroughly relaxed because he knew the telephone was far away and there was nothing he could do about it. But other than that he was always writing. Serling: Yes, absolutely. He really loved it up there. He felt he just had to get some distance from his work once in a while. And he'd also go back to Binghamton, where he grew up. I think sometimes he had a not-so-totally realistic memory of his childhood in Binghamton. But his memories were idyllic! Oh, he recalled some traumas of adolescence and that sort of thing, but his hometown was a great love. That's why whenever he had an opportunity, he'd go back to Binghamton, and sometimes just drive around on the streets, and kind of relive his boyhood. Rosenbaum: At what point did Rod first begin to develop The Twilight Zone? Serling: I can't remember specifically. I know I was talking to [actor] George Segal in 1985 when we were doing Requiem in New York as a play, and he was asking me questions like that, "When did this happen..." "How did this evolve..." And he said, "You were there, weren't you?" [Laughs] But that was 25 years ago! Who can remember? And I can't say exactly why Rod decided to get involved in a series but I do know that having control - creative control - was the important thing to him, and he realized that he would have that. With Twilight Zone, CBS said, "Hey, it's your baby, you go ahead and do what you want with it." And in truth, because it was a fantasy show, through analogy, parable and suggestion, he was able to say and do things that he was not able to do in a straight drama in those days. And so for him it was a happy playground. There was censorship to a certain extent, on words and things like that, but not on ideas and concepts. He could pretty much write what he wanted to. Rosenbaum: Rod was a prolific writer. How was he able to write as much - and as well - as he did? Serling: I think he was very disciplined. A writer has to be disciplined: other things have to be put aside. He would start working very early. He would get up and grab a cup of coffee and work pretty much all morning. In the beginning he had his typewriter, with his two-finger typing. Then, about the time Twilight Zone started, he began dictating. It was kind of fun to listen to him dictate because he acted out all the roles. I wish I'd saved those old dictaphone belts. But obviously, you have to have the inherent, creative ability and imagination. Rod used to say writing was the hardest thing in the world. But it was something he had to do. Even when he was on vacation, his mind was going. Sometimes, when I'd see him sitting outside in the sun by the lake, I'd say to myself: "Oh, he's not out there working; he can come in and watch the baby for a change!" But of course, when you're a writer, the mind never stops. He's keep a pad by the bed and jot down thoughts in the middle of the night. In the Twilight Zone days, he really had to come up with that material very quickly. But it came very easily for him. Some of the other dramatic work didn't! Sometimes the things he worked on were very difficult - a difficult pregnancy and horrendous birth. Rosenbaum: Where did he work? Rosenbaum: In the backyard, literally? Serling: Yes, we built an office in the backyard. Rosenbaum: What was it like, having a working writer around the house all the time? What sort of father was he? Serling: He always threatened to get a little office downtown! He was - I don't know how to put it, exactly - a liberated male. He never drew those sharp lines of demarcation: This is women's work and this is man's work." Rosenbaum: He obviously had a great fondness for children. Serling: Yes. He had a great rapport with children. He really did. Rosenbaum: He was also a very effective teacher, a very involved teacher, at Antioch and Ithaca and Cornell. Serling: At Ithaca he did a week-long seminar in the fall and one in the spring and a couple of other short courses. The kids loved them, because they got a credit for a week-long course. And what did they do? They sat and watched film! Then they had to critique it. But Rod was an easy grader. He hated to fail anyone! He also did a lot of speaking on college campuses all over the country. He enjoyed the contact with the students. He had mixed feelings about teaching. He wasn't sure he was offering anything of any great value. He did spend one half of a year back at Antioch College, teaching as a full-time writer in residence. At that time - this was in the '60s - it was a fairly political climate. He felt he was relating better in his evening courses, which were adult courses, than he was with the day students. Because he thought the students must be thinking: "What's this Hollywood fat-cat doing here on the campus? What does he really know? He's sold out to the Establishment." He really wanted to teach drama and creative writing. That was where his strengths were and that was where he really belonged. Rosenbaum: He was gardening up at the lake at the time he had the heart attack. Serling: It was just an inglorious way to have it happen, you know? He said that he'd like to have been on a podium with people hearing him, to go down in that kind of way. And here he was up in the garden pushing the roto-tiller. Rosenbaum: When he went into the hospital for open heart surgery, do you think he was scared? Serling: I think anybody in that kind of situation, particularly eleven years ago, when the procedure was not as common, would be. But he was willing to take the risk. Rosenbaum: He was always a vigorous-looking man with a lot of energy. It's difficult to imagine him slowing down. His dad died at about the same age, didn't he? 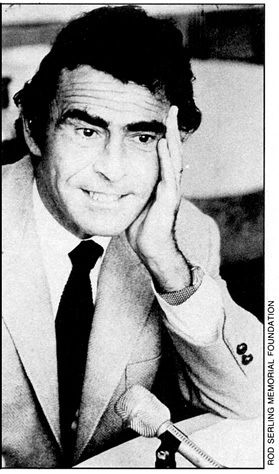 Serling: Rod's father died at the age of 52. The whole family had a history of heart complications and heart problems, most of the men in the family died around that age. So I think Rod always felt this was hanging over his head - I know he did. Serling: Well, that summer we were all together. And I guess we sort of pulled the curtains and took care of each other. We were all supportive of each other. We needed that. We were a very close group. And for those summer months we just sort of lived with it, lived through it. Rosenbaum: You seem to be very much involved with Rod's legacy these days. It seems like a full-time job. Serling: In a sense it is. It's not that I'm a keeper of the flame. But it has kept me busy. The Twilight Zone has turned into a business. I think Rod would be absolutely amazed that the interest is still there and that so many people remember his work. There are times when I think it's time for me to get out of the Twilight Zone! And I think, "Well, this will end next week, or next month or next year..." and then something else comes up. We're talking about doing a documentary on Rod. There are some very good people that are interested in doing it; it's just a matter of getting the clearances. It may happen yet. Rosenbaum: The Twilight Zone was filled with references to the strange, the unseen, and the unexpected. Did Rod believe in any of that? Serling: He really wanted to believe in the supernatural - ESP, visitations from outer space. Things like that. The lines in Peru at Nazca. He wanted to believe it was an airfield laid down long ago by visitors from out there. It was a willing suspension of disbelief. He wanted to believe in ESP studies that were going on at Duke University and various other places. But he had no direct experiences of his own and so he remained skeptical. He could be scared at night in a graveyard, but be fascinated by it at the same time. Long before The Twilight Zone his favorite reading material late at night would be short ghost stories or Lovecraft or Poe or James. But he was pretty even keeled. I mean, people must have thought he was kind of a far out guy and kind of nuts, but he wasn't. He really wasn't. Rosenbaum: All his life Rod was a man passionately devoted to justice. He spent a lot of his time fighting the network, the censors. It must have been hard in those later years to see the country tearing itself apart. It must have been demoralizing for a writer so optimistic about the human spirit. Serling: You couldn't be more right. He used to say the ultimate obscenity is not caring, not doing something about what you feel, not feeling! Just drawing back and drawing in; becoming narcissistic. I remember when he was in the hospital after his heart attack, and the whole Watergate thing was going on. I used to have to turn the television off, because he was getting so upset! He was so angry at what was happening in Washington, and the fact that so many people didn't seem to be concerned. He cared very deeply about things and felt that it was - it sounds pretentious - it was our responsibility to do something about it. I don't know how he'd feel about the current scene now, but he'd probably be out on some soap box somewhere. Bob Rosenbaum is one of the most knowledgeable experts on Serling's life and times. A writer, graphic artist, journalist, and radio producer, Rosenbaum has worked closely with the Serling Archive and Ithaca College School of Communications on a documentary on Serling's life, and designed the Rod Serling Memorial Exhibit on permanent display at the Broome County Center for the Performing Arts in Serling's home town of Binghamton, New York.